Well me either, which is why I’m an avid user of GasBuddy. GasBuddy is one of the most comprehensive fuel price apps I have played with. It is crowd-source powered, meaning it relies on end user input for functionality. It is a dynamic app, and it’s information changes all the time; as other users enter fuel prices, then the prices change for those just browsing. Now, I’m a pretty active user, so I’m always updating prices on the stations that I drive by every day. Naturally, it is safest to not enter fuel prices while stationary, so of course don’t distract yourself entering fuel prices while driving. A few features that I find really handy are the “find fuel near me” feature, and the “search and save favorites” feature. The app can be set to automatically display fuel prices at stations nearest your geographical location upon startup if you like. This is really convenient. Additionally, I like that I can search and save favorites, as I am a creature of habit and will often fill at the same station many times in a row. This app allows me to assess the stations in the vicinity to my favorite so I ensure I’m getting the best price possible. 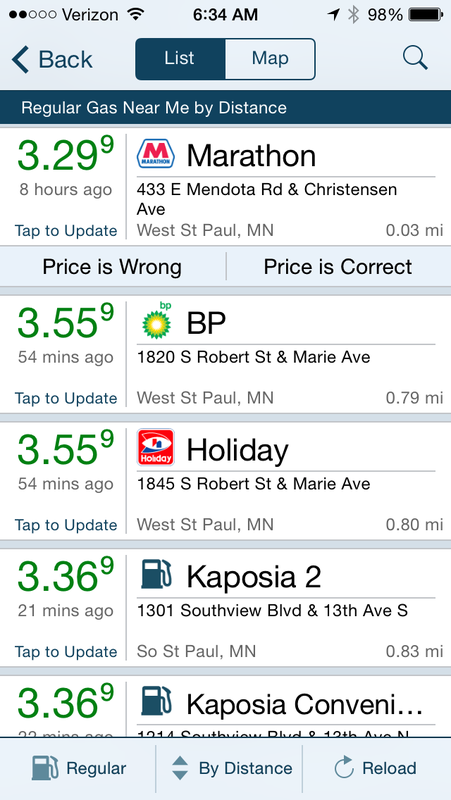 Download GasBuddy today from the iOS App Store, you’ll be glad you did! Let me know what some of your favorite apps are below. Whether they are work related or just a fave you can’t live without.